Synopsis : Yugo Hachiken dreams of life separated from his family, so he takes the initiative by enrolling in an agriculture school. He thinks, with his talent in studying, no problems will arise no matter what kind of school he attends. He is proven wrong very quickly. Raised as a city boy, he is forced to uncover the inconvenient truth about agricultural life. Enjoy the story of Hachiken, as he tries to keep up with his new friends, farmers' heirs, who are already accustomed to the harsh world of farming. With no clear goals or understanding of farming life, how will Hachiken survive this new, cruel reality? The story of a sweat, tear, and mud-stained youth begins! Note : This review is for season one and two, and will include me comparing this to FMA in hopes of convincing you guys to watch this series! The creator of this anime is Hiromu Arakawa, mangaka of the very successful Fullmetal Alchemist industry. The same important life lessons and concepts as FMA are present, though in a slice-of-life anime. The viewer follows Hachiken through his struggles as a student in a unknown agricultural life. In an attempt to escape from his past, he immerses himself completely in school life (sometimes a little too much), whether it be the class practicums, with his friends or his club activities. His past ideology about the "easy farm life" is challenged and corrected through his experiences. With this changing mentally, he hopes to use it to better his character and confront his family that he is not a failure. Welcome to your first day, Hachiken-kun! The art is similar to Fullmetal Alchemist, in the sense that the art is nothing spectacular but fits the mood of the anime. The facial expressions are quite amusing, and I keep thinking of FMA's ridiculous reactions whenever I see Hachiken's and Mikage's reactions. The scenery is nothing to really brag about. It is simple and is somewhat dissolved, in terms of colour, in order to make the characters really stand it. 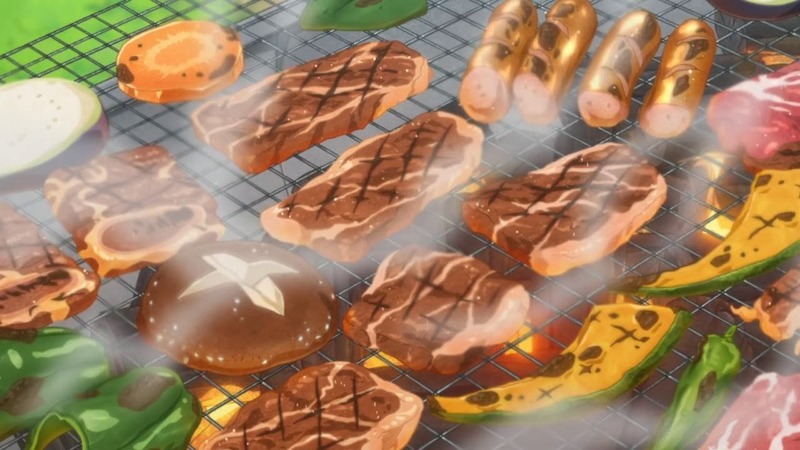 Though, the food art is really well-done (haha food pun). The animation and art of the second ending song are beautiful, the way the transitions emphasizes the song's beat. The opening and ending songs are wisely picked. They all have a country-vibe to them, fitting to the anime. The endings are definitely more pleasant on the ears, especially Goose House's "Oto No Naru Hou E". The background music does its job perfectly, adding the extra emotion that words cannot convey. The voice actors are well-suited for their characters. I love Ryouhei Kimura's raspy voice and how his voice matches Hachiken's voice in my head as I read the manga. The characters in Silver Spoon are great. They are typical high school students, except for the parts where the students need to wake up at 4am on a regular basis. They are hilarious to watch, especially their reactions. Hachiken's character is interesting, as his city-views bring a new perspective to the farm-raised students, and it is great watching their ideas and values collide. It really drives his character development. The other characters, except for Mikage, do not really have any development and slowly fade from the anime time to time. A look of determination that wasn't there before. 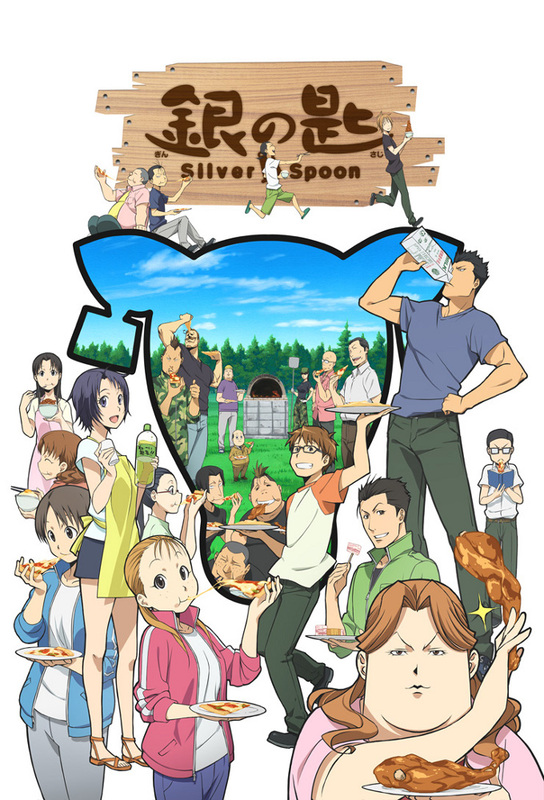 Silver Spoon was my favourite anime this past year. The unique storyline, hilarious characters, and wonderful soundtrack was a wonderful combination. The viewer experiences a roller coaster of emotions, from sympathy, to humour, to tears, to pride, and so many more. Seeing the group of friends evolve and strengthen their bonds together is heart-warming and makes me want to make the most out of my school years. I highly recommend this anime to anyone who enjoyed Fullmetal Alchemist and Uchouten Kazoku. If you have watched the series and liked it, the Silver Spoon Movie was released in Japan on March 7th, so look forward to the translated version! When Hachiken learns where an egg comes from. . .